Do you love scrapbooking? 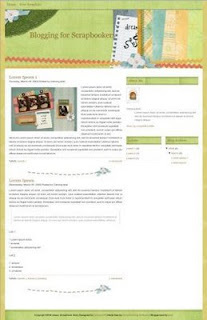 Looking for scrapbook template for your blog? I guess this is your right template. Green Scrapbook Diary wordpress theme is designed by Kathie and Andrew from Simply WP . I just convert it to blogger and make a lil bit customization. Kathie & Andrew have spent many time to make it free, keep intact their credit footer. No complicated setting. To edit navigation bar menu, go to page element, edit link list at top bar. Bong, nek aku gawe singkatan CB, keren gak...??!! nanti ada 2 scarlett, premium service dan free. bedanya, trletak pada tampilan page element+guide. Satu well organized dan yang satu tidak. Salam, can you make colourfull template that suitable for girls. I;ve been using your previous template and I kept searching for new template from you. @murni:what template you like? can you describe it? can u teach me how to download all this template? hi, love this template and i've used it in my blog -- but the date is not coming up, just the time, which is confusing... any idea how to fix this? clicked on download, next to preview, next to the template, then got to a new page that had a button "Download" and said how many megabits or whatever they measure it in it was. So I clicked that, then something popped up on my computer saying it was an unauthorized something since it was from the internet, I forget exactly how it worded it...and then it asked if I still wanted to open it. I clicked "open" and then a blankish page popped up-it had home, then the email icon thing on the upper left hand corner and that was it. Then, I saved it in my hard drive, went to blogger.com, edit layout, edit html. I clicked choose file, chose this layout that was saved in my hard drive, then clicked "upload". Then blogger said something in red, like it couldn't save it because it wasn't put in code properly, something like that. Can you please email me a step-by-step simple tutorial? Thanks! There is a thing I have noticed with the Green Scrapbook Diary template: the header image, even though when its dimension are set properly (i.e. width/height), gets slightly enlarged (from 100% to about 102%) when publishing the site. How come? The same happens with the background images for the sidebar section headers and, as far as I could see, the divider image. It's barely noticable, but enough to be pretty annoying, especially when you want to customize the template a bit further. thanks . make my blog better. how to used? i don't understand. bagaimana cara memakainya? saya tidak mengerti. Thank you very much for the template,.. I like this template very much, the green color is my fav. Hi, I'm Loving the template I’m using it (well helping my mum to use it) and it’s all working great but I just want to add options at the bottom for “older posts” and “newer posts”. When I looked in the code there seems to be something there that would make it function, but I don’t know how to modify it to get it working. Any help would be appreciated! Thanks. I was looking for scrapbook diary blog templates indeed and particularly in green color, so this is so great for me, many many thanks for this!! Published the green scrapbook dairy so nice and more interesting post scrap book so that can be enjoyment due to post.